Timothy Parr – RUSH, Inc.
Timothy Parr began working at RUSH Construction as the Site Safety and Health Officer in September 2018. A certified health and safety technician, Parr ensures that all RUSH, federal, state, and contractor safety regulations are followed, and most importantly, that all staff members are safe on the job site and go home at the end of the day. He also performs site safety audits and inspections, and provides supplementary safety training to personnel as needed. 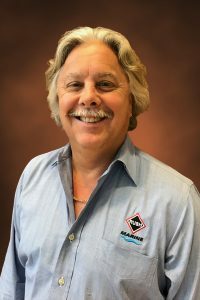 Having worked previously with RUSH Marine president, Tony Landry, Timothy was already familiar with the level of standards and integrity that’s expected at RUSH Construction. “I see the same values in others here at RUSH, and can attest to the ‘family’ attitude expressed by all,” says Timothy. Timothy’s understanding of the distinct needs at each level of the company and ability to communicate and lead as a team player make him an asset to the RUSH team. “I have been a trainer of one subject or another for the majority of my life and look at myself as a coach not a safety cop,” adds Timothy. Born in Indianapolis, Timothy is the youngest of four children, and spent his childhood weekends on their family farm outside of the city, wrangling cattle and riding horses. He describes himself as a “definite steak and potatoes kind of guy”. Timothy has lived in Indiana, California, Texas, and Florida, but considers the latter to be home. He is a lifelong fan of motorcycles (he prefers Harleys), and is also an avid scuba diver and spear fisherman.